My address to the Congress last evening is a sort of answer to your letter of April first, though I did not have an opportunity to read that letter until this morning. I am writing in haste just to say how much I appreciate what you have sent me. 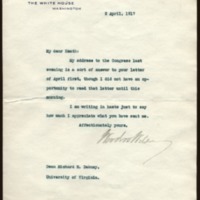 Wilson, Woodrow, 1856-1924, “Woodrow Wilson to Richard Heath Dabney,” 1917 April 3, WWP20520, University of Virginia Woodrow Wilson Letters, Woodrow Wilson Presidential Library & Museum, Staunton, Virginia.